An RC GeeBee Model X. Scratch built, won best civilian scale at the 2013 NEAT fair. 50” wingspan. Electric, superb flier. An RC scratch built Farman Sport. 13 inch span so a tiny electric RC airplane. Tricky to fly but does well outdoors as well as indoors in a gym. I have no memory of not building crap. So started maybe around 4 years old asbestos I can tell. Hope you gents are all well here. Adding pics is weird here. So here is more of an idea how the Gee Bee X compares to the 1930 original. Orthochromatic film from 1930 captures the orange colors on the original ship as quite dark. Adding pics is weird here. Great work, Chris. Glad to see you here. 13’ span so a tiny electric RC airplane. I'll assume that's a typo for 13" - or you have a dining room table of brobdingnagian proportions. Always loved the Gee Bee as a prime example of the best in early 30s leading edge aero design, with a touch of period art deco. Must have seemed very hip at the time - and as I recall, it was a helluva performer. Yours looks great! Normal Shaker dining room table. In Massachusetts you could consult (in 2013) with people who saw the actual Gee Bee ships fly. I suppose I have caught the tail end of such a possibility. "I'm still waiting on my Saturn V too"
I've never seen a GeeBee RC. I used to fly through Heathrow at least once a month, so bought First Light as soon as it came out. I stumbled on it stacked up at the bookstore in the terminal. I had never heard of the guy, yet there he was in the pics, so 100% genuine. Do not watch the UK TV show made from the book. It is un-good, especially compared to the superb book. No spoiler here but the way the book ends so abruptly can seem odd, yet perfectly captures the way it was. Stuff happened in the extreme, then it suddenly didn’t. If you get off the motorway right at Castle Bromwich, there is a remarkable large sculpture commemorating the Spitfires built there. Here is my 18” span indoor-only rubber power Spitfire Mk. I. It has a wrinkly look because it weighs only 18 grams including rubber. The wood is too light to withstand shrinking the tissue tightly. B-o-B colors done via chalk rubbed into the tissue. "Do not watch the UK TV show made from the book. It is un-good, especially compared to the superb book." RC airplaes are cool! I’ve been in flight school to fly regular airplanes, but if I figure that I don’t have the proper time to invest in that, I’ll take up RC. Go for it! Yeah Tim, a lot of the old kits had doped tissue paper skins, even the larger engine powered models. The trick was to tack the paper on as tightly as possible, then apply the dope. The paper shrank, as the dope dried, to drum head tightness. Several more coats of dope and a coat of paint added rigidity and strength to the skin. It wasn't uncommon for flying models to be covered in paper repairs, as even stiff dry grass could slice a cut in the skin. It was all part of the experience, and after every flight a thorough inspection was in order. I remember, very well, making the Grumman Wildcat rubberband powered model. It was a full and intricate build, with ribbed wings and control surfaces, the whole thing was covered by doped tissue paper. The firewall was a thin piece of hobby plywood and there was an optional set of plans for movable control surfaces, in case the builder decided to build it as an engine powered model. It was my first attempt at building an airplane, I was about 11 or 12 years old, and dad bought me a set of Xacto knives with different shaped blades (mom wasn't pleased, the ole poking an eye out thang). The model was highly educational, and took 2 or three weeks to build. I learned a lot from building that model, a lot more than just how an airplane goes together. I also learned how to use razor knives and sandpaper, as well as the the biggest lesson, patience. It's amazing how slow balsa wood glue dries, when you're an 11 year old kid. Chrisp2, those are beautiful models, well done! The Gee Bee is my favorite of the lot, it's always drawn my attention, and I've seen several RC 1/10th scale models of it. As a kid, I flew the thethered kind, round and round a few times, but never RC. I watch them across the Halawa valley from my house in the Aiea district park. Fascinating. My ex and her husband bought a pre built plane and paid about 5 hundred for it.. they crashed it first time out...Probably as or more expensive as guitars. Chrisp, if I had known you back in the day, I could have introduced you to Ed Granville, one of the brothers who built the Gee Bee planes! The name "Gee Bee" stood for Granville Brothers. 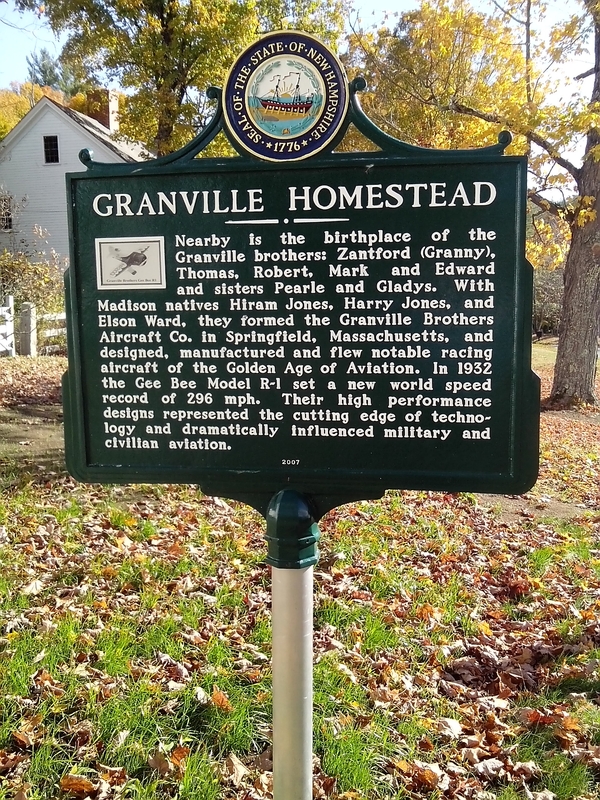 Ed Granville (and his wife, Charlotte), were summertime neighbors of my family, in the same New Hampshire town where the brothers were raised. I only know of the Granville Bros. being based in Springfield Mass. MANY RC models have been build of various Gee Bee planes. As far as I know, I have the only RC Model X, which was the very first of the low-wing “Sportster” models. But there are a huge number of RC models of the R1, E, Y and maybe some others.